The BMI calculator is a useful tool that measures whether you are overweight, underweight, or just right. Your weight alone is not enough to tell, as a tall, skinny man may easily weigh more than a short but rotund woman. The body mass index, or BMI, overcomes this problem by finding a ratio of your weight to your height, and returning a single number. This number will fit into a category on the scale of BMI ranges, which are defined as underweight, normal, overweight, and obese. What the various BMI ranges are. Divide your weight (in kilograms) by your height (in meters). Divide the answer by your height again to get your BMI. BMI = weight / height². Our BMI calculator makes it a piece of cake for you to find your number. However, please remember that BMI is a rough estimation. The result can be somewhat misleading for individuals who are well muscled (such as body builders), or for those who have lost a significant amount of muscle (such as the elderly). If you are unsure whether or not you fall within the "normal" range of muscle mass, please consider using one of our more specialized calculators. The body fat calculator can zero-in on your percentage of body fat, while our lean body mass calculator can tell you how much you would weigh without any fat. The BMI Prime is a nifty modification to our own BMI calculator. It's a decimal number where 1.0 = the upper limit to the "normal BMI" range. It's a super easy way to see if you're overweight or not. If your BMI Prime is more than 1, then you've got some weight to lose. 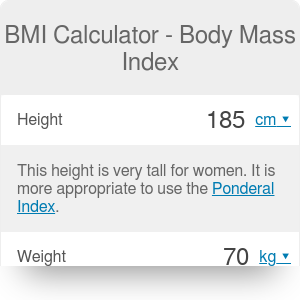 At the top of our BMI calculator are fields for you to plug in your height and weight. Plug in these values, and you'll instantly have your BMI, your BMI Prime (see above) and a little message telling you what range you fall into. If you're overweight and want to know exactly how much you'll have to lose to get into the healthy range, you can do that too. Leave your height and weight in the boxes where they are, and type "0.9" into the BMI Prime box. Your weight and BMI will adjust themselves. Tip: If your height box adjusts itself when you change other boxes, you'll need to lock it. Click the right hand panel of the box and select the lock icon to hold that figure in place while you play with the values in other boxes. That is... unless you plan on growing taller! If you want to know if your metabolism is on your side in your quest towards a healthy weight, try our basal metabolic rate calculator. We often hear about things raising or lowering our metabolism (which one does skipping breakfast do again?) but we don't hear much about tracking those changes. That's what this calculator is for. BMI Calculator - Body Mass Index can be embedded on your website to enrich the content you wrote and make it easier for your visitors to understand your message.